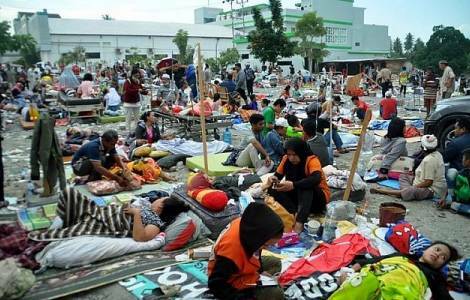 Palu (Agenzia Fides) - There is great mobilization for humanitarian aid by Catholic communities and relief agencies after the tsunami and the earthquake hit the island of Sulawesi, Indonesia, on 28 September. Palu is the most affected city. The earthquake triggered an unexpected tsunami in the city, which has about 380,000 residents. The disaster has already caused more than 1,200 victims and has destroyed over 17 thousand buildings, shopping centers and mosques. Infrastructure has also been severely damaged, landslides have blocked roads and it is difficult to bring relief to survivors. There is growing concern also for the Donggala region, north of Palu which is closer to the epicenter of the earthquake, and two other districts - with a total population of around 1.4 million. "Humanitarian groups are struggling to get people into affected areas", says to Agenzia Fides Yenni Suryani, CRS’ (Catholic Relief Services) Indonesia country manager from Jakarta. "With the airport damaged, getting access to Palu and Donggala is a huge problem. Responders and local aid groups are having to drive overland 10-12 hours. That means a bottleneck for relief supplies in coming days. Landslides are hindering road travel in some places. There is very limited electricity in Palu but power is out almost everywhere. Some mobile phone towers have been repaired allowing limited communication", he says. So far, almost 60,000 people have been displaced and need emergency aid, but in the meantime rescue operations continue and the death toll rises. An emergency team from Caritas Indonesia is also heading to Palu to assess the needs of the survivors of the Indonesian tsunami and earthquake, explains Father Banu Kurnianto, director of Caritas Indonesia, to Fides. "Survivors struggle to find food and drinking water. They also need adequate shelter and medical support. The earthquake has damaged roads and telecommunications, creating many problems for sending assistance and personnel in the area", he notes. "We are strengthening our team in Makassar and we are also sending a team from Jakarta", adds Yohanes Baskoro, program manager for Caritas Indonesia, locally known as "Karina". "It will take a long time to recover from this disaster", he says referring that "the water supply has been contaminated because of the corpses, and this represents a potential threat of epidemics". "We pray for the volunteers who are trying to save lives in Sulawesi", says to Agenzia Fides Yuli Nugrahani, a social assistant who works for the Justice and Peace Commission in the diocese of Tanjungkarang and in the Indonesian Bishops' Conference.